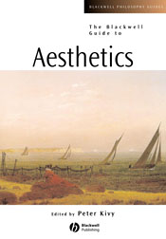 The Blackwell Guide to Aesthetics is the most authoritative survey of the central issues in contemporary aesthetics available. The volume features newly commissioned papers on the evaluation of art, the interpretation of art, and many other forms of art such as literature, movies, and music. Provides a guide to the central traditional and cutting edge issues in aesthetics today. Written by a distinguished cast of contributors, including Peter Kivy, George Dickie, NoÃ«l Carroll, Paul Guyer, Ted Cohen, Marcia Eaton, Joseph Margolis, Berys Gaut, Nicholas Wolterstrorff, Susan Feagin, Peter Lamarque, Stein Olsen, Francis Sparshott, Alan Goldman, Jenefer Robinson, Mary Mothersill, Donald Crawford, Philip Alperson, Laurent Stern and Amie Thomasson.